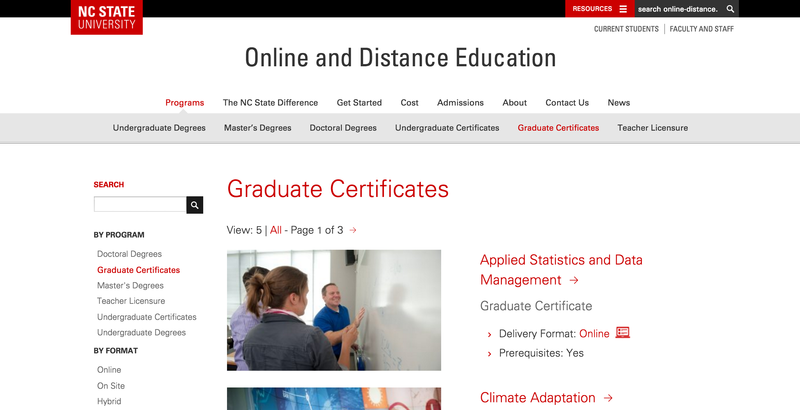 At the end of this fiscal year, NC State Distance Education was officially renamed as NC State Online and Distance Education. The new name provided the perfect opportunity to redesign the website in compliance with the university’s brand initiative. NC State University debuted its new brand in 2014. In 2015, Chancellor Randy Woodson issued a mandate that all university websites and social channels become brand compliant. DELTA knew it needed a new website for its online and distance education programs since the site was outdated. Distance Education also needed a better way to recruit students. Knowing that marketing is primarily done online, Educational Marketing Group (EMG) was retained to help with this mission. EMG was hired to create a new branded Online and Distance Education website as a way to represent itself as part of the core university brand. Prior to the name change, EMG also helped with researching a possible new name for distance education. As part of that partnership, market research was conducted on the terms “distance education” versus “online education.” “Distance” was a more popular term when used among international searches. “Online” was more popular with national searches. EMG conducted a survey distributed to distance education faculty, administrators and students about possible name changes for distance education at NC State. According to DELTA Vice Provost Tom Miller, there were several good suggestions considered. “Online Education” and “Online and Distance Education” were both positively received. After moving the renaming through the administrative process, Online and Distance Education was approved as the new name at NC State. “It is important to consider that so many of our campus students are taking online courses. Calling them distance education for the campus students doesn’t really make a lot of sense,” said Miller. “If we had chosen one of the catchier names, such as Global Online, it would have taken away from the NC State brand. It really is important to have the NC State brand first and foremost in people’s minds,” said Miller. How do prospective students find the best online and distance education programs? By searching online! The new Online and Distance Education website is a high performing SEO site that was designed to maximize the reach of the site to all major search engines by using SEO best practices. SEO is now a requirement to stay relevant in the higher education student recruitment market. The website was ready to launch at the end of the fiscal year during the summer of 2016. Miller said, “It is now fresh, more user-friendly, on brand and smart.” WordPress, the content management system used, is able to aggregate material and content. Instead of creating additional or multiple pages about registration and records or graduate school application deadlines, information now pulls directly from the source website, which eliminates the need to duplicate information and possibly have outdated information on a page. We invite you to visit online-distance.ncsu.edu and see the highly creative, SEO optimized website and search for online or distance education programs that meet your needs. Before the website launch, EMG trained staff and DE coordinators on the functionality of the new site. EMG showcased the ease of maintenance and updating the website. Recent research suggests accurate and updated information is key to recruiting students. “We knew our website was outdated and we also had programs struggling to recruit students. We needed to revamp our website to make it state-of-the-art to serve as an exemplar for our programs,” Swanson said. Most of the inquiry traffic from prospective students is directed from the distance education sub navigation on the NC State website. DELTA collaborated with University Communications to rebrand the page to include infographics and up-to-date information about the NC State Difference in its approach to online education. Style, voice and tone on the new pages match the university’s voice and tone. Content is written in a way to demonstrate the university’s brand personalities of courageous, innovative, intellectual and purposeful. NC State Online and Distance Education is now reflected in the social media world, as well. A dedicated social media specialist was hired in May 2016 to create a strategic social media plan to launch four social media channels for NC State Online and Distance Education. The name @NCStateOnline is used for Facebook, Twitter, Instagram and Online and Distance Education’s news blog. Also, an Online and Distance Education LinkedIn page was created to recruit working professionals looking to further their education and career to learn about our programs and world-renowned faculty. Building up enrollments with the university’s land-grant mission and giving students and prospective students the access to programs offered was a priority. Social media created a channel of communication Online and Distance Education was not a part of until the summer of 2016. Social media is an extension of how NC State Online and Distance Education wants to connect and engage with current and future students and to show them why they should choose NC State. “It’s how our students communicate and it makes sense for us to meet them where their common ground is,” Swanson said about adding social media. With a new name, new website and four new social channels, NC State Online and Distance Education became more recognized. There was more of a national and international presence for our online and distance education programs. The combination of the new site and the social media effort is allowing the NC State Online and Distance Education programs to reach university goals of student success and global engagement. 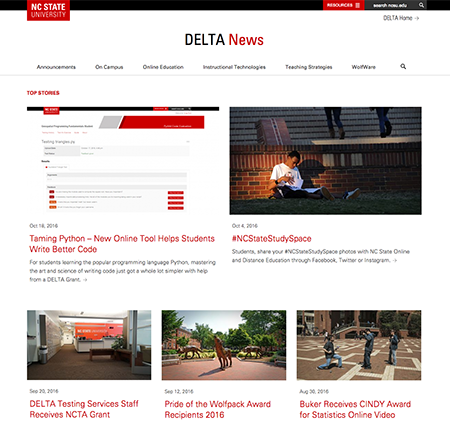 In addition to NC State Online and Distance Education’s rebranding efforts, DELTA also changed its online presence by adding a new social media channel and partnering with University Communications to create a brand-compliant news channel. The changes include a new Twitter account and the creation of DELTA News (formerly DELTAwire). A committee within DELTA was created to launch Twitter to reach audiences that largely already communicate through social media. In August 2015, the Twitter handle @NCStateDELTA was approved and established as an official DELTA channel to promote faculty services and news within DELTA. 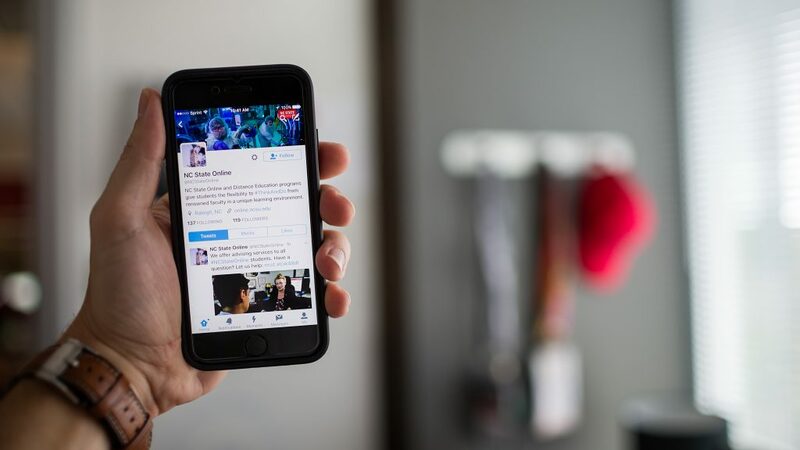 DELTA Communications Specialist Sherry O’Neal said, “Connecting with faculty who we have worked with is one of the most beneficial things about Twitter.” As the manager of @NCStateDELTA, O’Neal sees the impact the social media outlet makes everyday. If a faculty member misses a workshop, they can check Twitter for live updates and still gain information from the workshop. The new Twitter account reaches a broader audience more quickly and effectively. It allows DELTA to engage its followers by retweeting interesting content, too. Along with Twitter, the rebrand of DELTA News will allow news to be shared on campus through Newswire, University Communications’ news aggregator launching late 2016. The change will allow colleges to easily share and repurpose DELTA News stories, and vice versa. Both Twitter and DELTA News reach a large variety of people very quickly.